JNN 29 Jan 2014 Baghdad : Iraqi Prime Minister Nouri al-Maliki has again reiterated that he will not enter negotiations with terrorists, saying that crushing terrorists is one of the priorities of the current Iraqi government. At the same time he lashed out at neighboring Saudi Arabia for backing terrorist groups operating inside his country. “Whichever side that is not opposed to terrorist groups, is not worthy of partnership in running the country’s affairs,” Maliki went on to stress. The development comes as the Iraqi army has engaged in an extensive military operation in the al-Anbar province since December 21, 2013, to suppress the terrorists and al-Qaeda elements, in cooperation with ethnic and local police forces. Iraqi Prime Minister Nouri al-Maliki has lashed out at neighboring Saudi Arabia for backing terrorist groups operating inside his country. 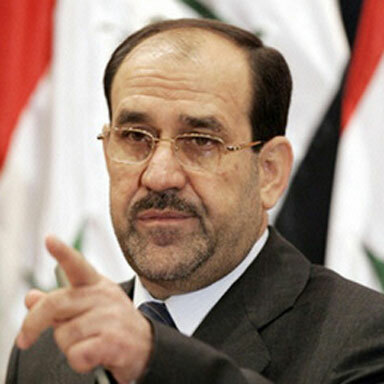 “The current terrorism originates from Saudi Arabia,” Maliki said in a recent interview. The Iraqi premier also criticized Saudi Arabia as well as Qatar and Turkey for sponsoring terrorism in neighboring Syria. Earlier this month, Maliki informed UN Secretary General Ban Ki-moon that Riyadh must be held responsible for the recent wave of bloody terrorist attacks having claimed more than 800 lives in Iraq so far this month. Violence has surged across Iraq in recent months, reaching its highest level since 2008. In recent weeks, the country has been the scene of fighting between security forces and militants from the al-Qaeda-affiliated Islamic State of Iraq and the Levant (ISIL) in the western province of Anbar. The bloodshed later spread to Fallujah and militants moved in and seized the city and parts of Ramadi. This entry was posted in Iraq News, Middle East and tagged Iraq, Iraqi, Iraqi government, Islamic State of Iraq, Maliki, Nouri al-Maliki, Saudi Arabia, Terrorist. Bookmark the permalink.